Tarps Plus Blog: Silver Poly Tarps On Sale Now! Silver Poly Tarps On Sale Now! Are you looking for a heavy Duty Tarp? If you are looking for a heavy duty Tarp, the Silver Poly Tarp is a great option. The Silver Poly Tarp is one of the most heaviest duty Tarps stands close to the white poly tarp in mil thickness. The Silver Poly Tarp averages at about 10 mil in thickness, it is waterproof, acid resistant, tear resistant, grommets every 18 inches, mildew resistant, rope reinforced, arctic flexibility, UV treated on both sides, and 1200 denier, 14x14 weave count. For a heavy duty tarp the Silver Poly Tarp is a great choice. 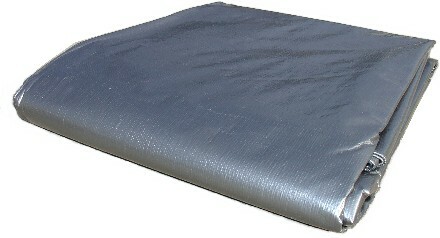 Many like to use the Silver Poly Tarp ad a cover, great to cover boats, sea-doo's , and anything and everything else. The lifespan for these poly tarps are over 3 overs, in comparison with other poly tarps that last a only a month or a few. Come check out the tarps plus store www.Tarpsplus.com. I received my order of 10 silver poly tarps, they are just wonderful. Great prices and I love my poly tarps. You guys are my #1 tarp supplier, awesome products! Will never get my poly tarps any where else. These tarps really do last. This is my second in 8 years. Getting Ready For The Summer! In Need of a Hay Tarp?